Quinoa and I have not always been friends. I much prefer rice and pasta over the hyped-up grain even though I know people love it. And what’s not to love: It’s gluten-free, packed with fiber and protein, and it’s even Passover-friendly. So since it’s that time of year when everyone is eating lighter, and colorful vegetables and fruits abound, I decided to give it another chance and added some hearty red quinoa to a salad recently. Lo and behold, I became a quinoa convert, adding it to salad after salad. 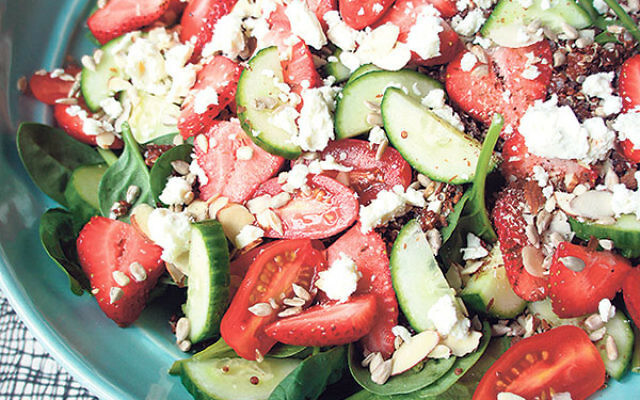 I served a spinach and quinoa salad with fresh local strawberries earlier this summer for a Shabbat dinner with friends, and it was devoured. Then again, when I was in Los Angeles a few weeks ago, I made this salad with figs instead of berries, and it was equally delicious. Try it with plums, peaches, or any seasonal fruit that you love. Place spinach in a large bowl or platter. 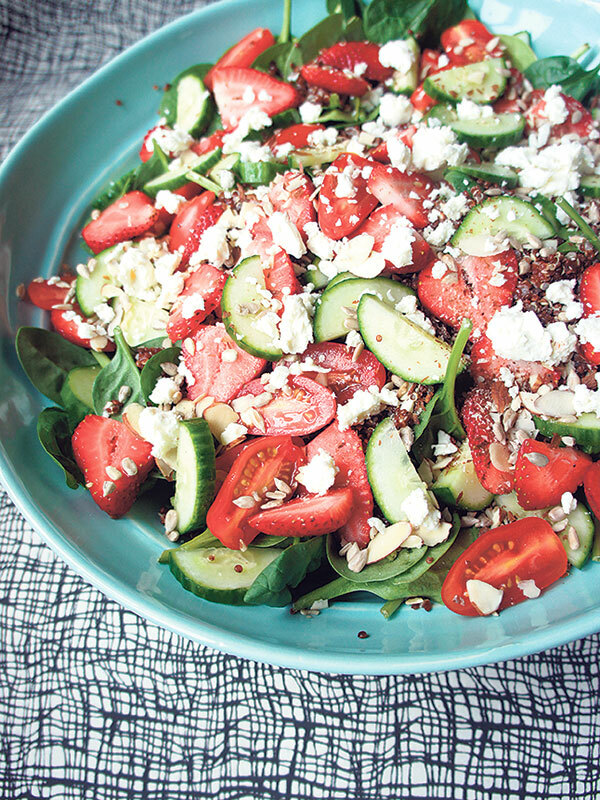 Top with quinoa, cucumbers, tomatoes, berries (or other fruit), sunflower seeds, and feta cheese, if desired. Whisk together lemon juice and zest, mustard, and honey. Slowly whisk in oil until dressing comes together. Pour dressing over salad and toss to coat. Serve immediately. The Nosher food blog offers a dazzling array of new and classic Jewish recipes and food news, from Europe to Yemen, from hallah to shakshuka and beyond. Check it out at TheNosher.com.